Apple’s press conference at their headquarters in Cupertino, California was no doubt the most awaited and discussed event in the media and online world for the past 48 hours and now that it’s over, all speculators have the right to say “We told you”. 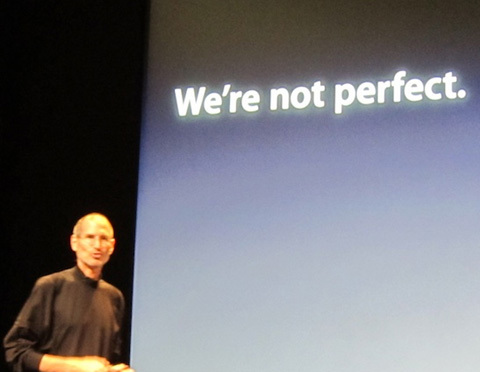 CEO Steve Jobs conducted the event and started by saying “We’re not perfect. Phones are not perfect.” He then went on to count the company’s achievements and described the iPhone 4 as their most successful product, having sold 3 million devices since the launch. Jumping straight to the iPhone 4 antenna issue which has been dubbed ‘antennagate” by all and sundry, Steve Jobs demonstrated how the BlackBerry Bold 9700, HTC Droid Eris and Windows mobile phone, a Samsung Omnia II, lose signals when gripped from different angles especially from where the antennas are installed. Hence the result: Phones aren’t perfect, smartphones aren’t perfect and the new iPhone’s reception issues are nothing but exaggerated negative reporting from the media. It was also reported that only 0.55% iPhone 4 users have complained about its reception issues and according to AT&T’s data the iPhone 4 drops less than 1 call per 100 compared to the iPhone 3GS. So, said Steve Jobs “there is no antennagate”. However, Apple is ready to offer the best and probably the only solution available for the iPhone’s ‘death grip’ to all buyers for free. All those who will buy the device till September 30th will get the free phone case that solves the signal problem by preventing skin contact with the sensitive area. All those who have bought the case are entitled to a refund and those who haven’t can get one from their retailer. Answering questions at the end of his address, Apple’s CEO bluntly referred to Bloomberg’s claim of him knowing about the iPhone’s antenna issues prior to release as a complete lie. All in all, it’s fair to say that Steve Jobs pulled off quite a feat in boldly taking on the complaints and criticism and presenting the iPhone’s case in a way that can’t be disputed or rejected. All the other smartphones presented did actually lost reception when their antennas came in to contact with human skin. Giving free cases to all the existing 3 million customers and more till the end of September was also a smart move. They did all that was possible and maybe now the world can move on to waiting for whatever Apple product releases next.